Leaving your dog in your hotel room? Let housekeeping know! 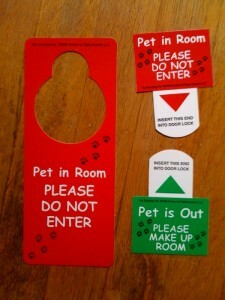 These clever tags either hang over your hotel room door knob or slide into the slots of front- or top-facing electronic locks, and tell housekeeping to pass over your room because your dog is inside (or to come in because your dog is out). They’re particularly useful if your dog is unconfined in your room, but even if your dog is in a travel crate you probably don’t want housekeeping in your room while you’re away. The alternative is to leave a message with housekeeping, but we all know that messages can go astray. These tags are inexpensive and impossible to miss. I’m adding them to Chloe’s travel and packing checklist!